SuperMicro is known as a supplier of components for the market of file and telecommunication servers. 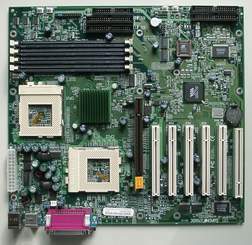 The most part of motherboards from this company use standard and reliable solutions based on the Intel's chipsets (the most efficient systems are equipped with ServerSet series chipsets from ServerWorks), but the configurations do not offer any modern overclocking monitoring and other possibilities. It is explained by the fact that the main goal of the company is to manufacture products of the highest reliability. This is proved by a 2-year warranty for products of this company. But not so long ago a mainboard series has acquired products based on the Via chips - solutions on the latest Via Apollo Pro 266 chipset. It means that Intel products do not meet the requirements of all motherboard manufacturers and can't serve a base for a series of products of the whole range of prices and technologies. Secondly, it signifies that Via chipsets are on the same level with Intel products, and SuperMicro trusts its reliability. There are only two key differences of the Apollo Pro 266 chipset from the previous generation: DDR SDRAM support and a speedy bus between a north and a south bridges - VLink. Now it provides a twice greater throughput - 266 MBytes/sec. As for the first difference, the 370DDE board has no any DDR SDRAM slots - when the company was developing the board, the DDR memory was considered too expensive, and the majority of customers preferred SDRAM. That is why the 370DDE is positioned as not a dear variant of a dual-processor board on the 440BX, which supports modern processors with a 133 MHz system bus (plus, PC133 memory and AGP 4x mode). But in the coming month the company is planning on launching a new series of P3TDDxx boards based on the Via Apollo Pro 266 with support of the DDR SDRAM and Tualatin CPU in different form factors (meant for servers as well). 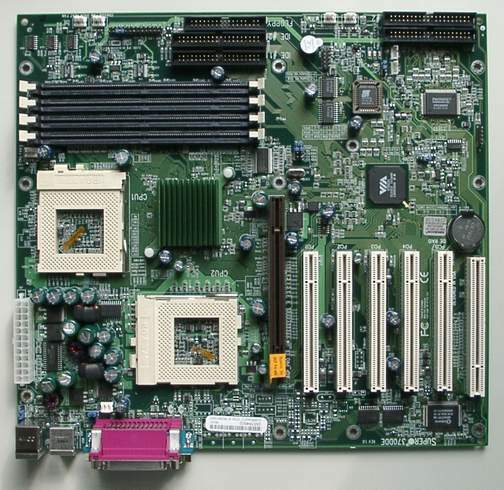 The board ships in a standard big blue box, which, apart form the board, contains a manual, a CD with drivers, 1 34-pin FDD and 2 80-pin UDMA66/100 cables, a bracket for a rear panel of a PC on one additional USB port, and 2 quite good fans for Socket 370 processors from AVC. The thick manual in a traditional for SuperMicro style consists of a description of the board and documentation for the IDE RAID controller. Unfortunately, there are some discrepancies, contradictions and flaws. Since the board is of a standard size, it fits any ATX case. Nothing prevents installation of processors, and there is enough space for fans. There is no need in a plug for a socket of the second processor if only one CPU is used. By the way, it is the first board where a socket of the first processor is located closer to the memory slots than the socket of the second one. Connectors of processors' fans are placed quite successfully - their cables block nothing. The power supply connector corresponds to a 24-pin SSI standard, but it allows also for installation of a usual 20-pin ATX power supply unit. The north bridge is covered with a heat sink, but during the testing its temperature didn't exceed 38 degrees Celsius. The memory slots are located quite far from an AGP connector, that is why installation of memory modules can be prevented only by a full-sized video cards. The layout is on the whole rather successful - in any configuration it is possible to install 3 full-sized PCI cards. IDE, FDD, IDE RAID connectors are located near the edge, and their cables do not prevent installation of expansion cards and memory modules. Winbond W83627HF-AW was chosen as an external system monitoring chip. The processor temperature is unfortunately controlled by external sensors. The board has 3 fan connectors with a rotation frequency control - two are for processors and one is for the case. Besides, there is a connector for a fan which gets switched on automatically in case of overheat, and two additional uncontrolled connectors for case's fans. In this case the LDCM warns about an out-of-order fan of the second processor, but the latter is not installed - now the board has one processor and, therefore, one fan. There is an additional diagnostic means - three LEDs located near IDE RAID connectors. This technology is named "Debugging LED". When a PC is booting it shows some stages of POST passing. For example, the photo demonstrates a situation when the FSB was set at 180 MHz and the PC hang :)- according to the table this combination means an initialization process of a clock generator. The full description of all combinations is given in the User Manual. Usage of the Award BIOS for this board is untypical of this company. Maybe, AMI failed to prepare its version with the Via Apollo Pro 266 support in time. The BIOS contains a wealth of different settings, including memory operation (frequency, CAS2/CAS3, special registers of the VIA8633), AGP (4X mode, Fast Writes), IRQ distribution among PCI slots, a loading sequence for devices. This motherboard offers adjustment of memory parameters (including the memory interleave) from the BIOS. You just have to switch a memory adjustment from "by SPD" to "manual". But in this case the memory performance lowers substantially - in the SiSoft Sandra 2000 test we have only 249/263 instead of 361/377. And even with the 4-way interleave the speed is only 341/367. It seems that the BIOS in a manual mode allows for changing not all parameters, and adjusts them much better in the auto mode. But such approach is appropriate for boards meant for professional use. The iP3 800EB processors on this board reached 840 MHz (FSB=140) in uni- and dual-processor configurations. The system worked stable. 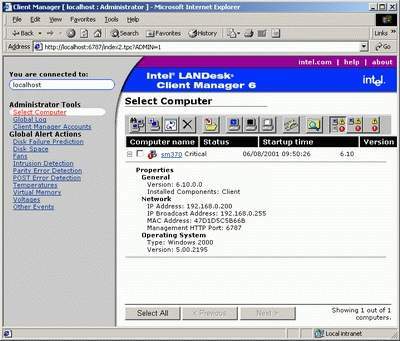 At 150MHz the system started but hang when the Windows 2000 was loading. The processors were earlier checked on other boards and proved that they could work at 150 MHz, with the VCor being lifted however. The motherboard was compared with a leader of previous dual-processor tests - the ASUSTeK CUV4X-DLS board. 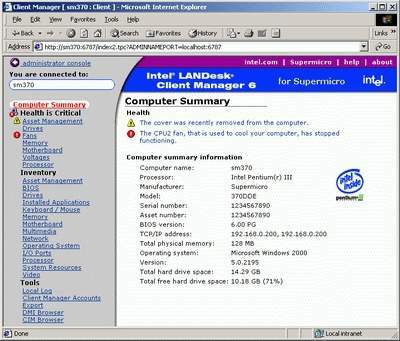 The SuperMicro 370DDE board has outscored, though by a little margin, the ASUS CUV4X-DLS board. On the whole, in the Sysmark 2000 test the SuperMicro 370DDE is leading, though the ASUSTeK CUV4X-DLS is not too far from it. It is an interesting diagram - it turned out that a dual-processor PC is counter-indicative for Microsoft Office 2000 applications! But I think that we should expect a gain in case of, for example, working with the Word files, e-mail reception, archiving and printing. Now let's look at the results achieved with the Quake 3. This test is still popular for measuring speed of operation of mainboards, since it uses the professional technology OpenGL, supports SMP and depends considerably on an internal speed of the chipset and the memory. I want to thank our expert in video cards Andrew Worobyew for the help in organization of a benchmarking process. This time we used three demos: crush, quaver and demo002. For the first one we set the Normal Quality mode, for the quaver - High, and for the demo002 - Fast. To prevent an influence of the desktop settings, we set "16bit" instead of the "Default" in the color parameters in the fast and normal modes. The tests were run three times each, the results were averaged. It means that the measurement accuracy was within 0.5% with the 0.95 probability. As you can see, the 370DDE is again ahead. But with the raise of resolution, i.e. when a load on a video card is growing, this difference becomes practically unnoticeable. On the whole the situation is similar to the previous one. The SuperMicro is faster than its contestant by 4-9% on average (where the speed depends on the processor and the board, and not on a video card). This diagram shows how hard these tests are for the processor and the video card. Of course, we mean not only a clip, but also the image quality parameters. The equal results with one and two processors and nearly the same gain with the second processor in case of the 'crush' say that this test is not so difficult for the video system than for the processor. The speed starts decreasing only at the maximum resolution and only with two processor enabled. It means that this test is better to use for comparison of processors and not video cards. The quaver results become almost independent on a processor speed starting from 1024X768 - in both cases they are equal to 110fps. At 1280X1024 the '70fps' figure is defined by the video card speed. That is why this test can be used for estimation of modern video cards' speed only with a processor not less than 1000 MHz and starting from 1024x768, otherwise the processor will severely affect the results. The fps value for the demo002 is similar to the crush. The weak video settings have resulted in the fact that in the most of combinations a speed depends on the processor, and the video card influences only starting from 1280X1024. Unfortunately, today video card drivers have a great deal of quality/speed settings, that is why their correct usage may be difficult. And here, tests results with different processors and quality levels become more precious. And whether it is worth losing several fps in favor of better image quality is for you to decide. As you can see, the performance drop in the AGP 2x mode is no more than 1%. That is why today you can work with 32 MBytes video cards in AGP 2x mode. But it is possible that soon we will get games with a greater volume of textures, and then the AGP speed will play a greater role. lack of DDR SDRAM slots.